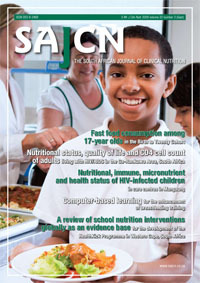 Aim: The aim of this study was to review all school interventions having a nutrition component, published in peer-reviewed literature between 1995 and 2006, and to document activities that were successful as well as possible barriers in order to develop a best practice school intervention for Western Cape Province, South Africa. Methodology: A systematic review of school studies revealed 85 which complied with the predetermined search criteria. The following outcome measures were considered in the evaluation of the interventions: (i) Changes in nutritional knowledge, attitudes, self-efficacy, and stage of change (ii) changes in dietary behaviours; (iii) changes in clinical/physical markers such as: body weight or BMI, blood pressure or serum cholesterol concentrations; and (iv) process and/or policy outcomes. Results: Key success factors of school-based interventions appeared to be: A nutrition-based curriculum offered at school by trained teachers’ generally improved behavioural outcomes. A physical activity programme and parental component were associated with most of the best practice clinical and behavioural outcomes. Furthermore, all best practice studies were grounded on a firm theory of behaviour, such as social cognitive; social marketing or stages of change. Most of the interventions which included a food service component had best practice behavioural outcomes. Conclusions: Numerous school-based nutrition interventions have shown significant improvements in children’s nutritional behaviours. Consequently it is necessary to plan programmes based on existing evidence of best practice. The lessons learned from this review have been applied in the development of the HealthKick programme initiated in schools in the Western Cape in 2007.